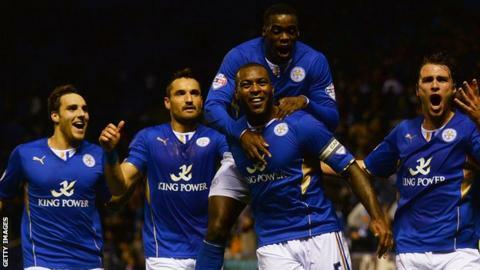 Leicester heaped more pressure on Fulham boss Martin Jol with a dramatic win in the Capital One Cup. Fulham took the lead through Hugo Rodallega before Wes Morgan and Chris Wood gave Leicester a 2-1 lead. Ignasi Miquel extended the lead with a header before Rodallega scored his second straight from the restart. Giorgos Karagounis equalised for the Cottagers with just three minutes to go but there was still time for Lloyd Dyer to win it for the Foxes. The result keeps up Championship side Leicester's impressive home form, which sees them unbeaten after nine games, while Fulham's miserable run continued. Could it be an omen? The last time Leicester reached the last eight of the League Cup they went on to win it in 2000. They have won just three times in the Premier League so far this season and Saturday's 2-0 defeat at Southampton was their fifth of the campaign, adding to the pressure on Jol. The Cottagers boss made nine changes from the side defeated at St Mary's - but that could have had as much to do with their failure to create a single chance at the weekend rather than any sense of Jol showing his priorities. Fulham went ahead in the 18th minute when Damian Duff played in Karagounis, who squared the ball for Rodallega to side-foot home. The goal sparked the home side into life with Paul Konchesky twice firing over against his former club, before Wood went close. Fulham keeper Maarten Stekelenburg, a summer signing from Roma, made a double save from Anthony Knockaert but he should have done better when the equaliser came. Knockaert swung in a free-kick with pace but the keeper got it all wrong and the ball hit his chest, falling for Morgan to head home from close-range. Leicester went ahead on the stroke of half-time when Wood scored his fourth goal in this season's competition. The New Zealand international, who scored a hat-trick in the 5-2 win at Carlisle in the last round, took advantage of some poor defending from Philippe Senderos. A casual clearance from the former Arsenal defender hit the head of Konchesky and deflected into the path of Wood, who made no mistake. Things went from bad to worse after the break for Jol, when Ignasi, on loan from Arsenal, scored his first Leicester goal. The Spaniard rose highest to head home a cross from Danny Drinkwater. The home fans were still celebrating when Rodallega scored his second of the night straight from the restart, when he was left marked to head in a hanging cross from Elsad Zverotic. Jeffrey Schlupp twice went close for Leicester before his keeper Kasper Schmeichel made an excellent point-blank save from Bryan Ruiz. With time ebbing away, Karagounis added a goal to his assist with a thundering free-kick which gave Schmeichel no chance. The equaliser was nothing less than Fulham deserved but there was a sting in the tail as David Nugent, on as substitute, set up Dyer with his first touch and he made no mistake to send Leicester through to the last eight. "It was a good game between two sides trying to win it. I am probably a bit more relaxed than Martin (Jol) but it was a good night for us. "You can look at the goals they scored and talk about the possible difference between the Premier League and Championship when it comes to taking chances. "It could have gone either way but we've come out on top." Match ends, Leicester City 4, Fulham 3. Second Half ends, Leicester City 4, Fulham 3. Jeffrey Schlupp (Leicester City) wins a free kick on the right wing. Foul by Darren Bent (Fulham). Giorgos Karagounis (Fulham) wins a free kick in the attacking half. Goal! Leicester City 4, Fulham 3. Lloyd Dyer (Leicester City) left footed shot from very close range to the bottom left corner. Assisted by David Nugent. Elsad Zverotic (Fulham) is shown the yellow card. Daniel Drinkwater (Leicester City) wins a free kick in the defensive half. Substitution, Leicester City. Jamie Vardy replaces Chris Wood. Substitution, Leicester City. David Nugent replaces Anthony Knockaert. Goal! Leicester City 3, Fulham 3. Giorgos Karagounis (Fulham) from a free kick with a right footed shot to the top right corner. Bryan Ruiz (Fulham) wins a free kick in the attacking half. Aaron Hughes (Fulham) wins a free kick in the attacking half. Daniel Drinkwater (Leicester City) wins a free kick on the left wing. Substitution, Fulham. Steve Sidwell replaces Derek Boateng. Giorgos Karagounis (Fulham) wins a free kick in the defensive half. Attempt blocked. John Arne Riise (Fulham) left footed shot from outside the box is blocked. Wes Morgan (Leicester City) is shown the yellow card. Adel Taarabt (Fulham) wins a free kick in the defensive half. Foul by Derek Boateng (Fulham). Giorgos Karagounis (Fulham) is shown the yellow card. Anthony Knockaert (Leicester City) wins a free kick in the defensive half. Foul by Giorgos Karagounis (Fulham). Attempt missed. Chris Wood (Leicester City) right footed shot from outside the box is too high from a direct free kick. Philippe Senderos (Fulham) is shown the yellow card. Hand ball by Philippe Senderos (Fulham). Attempt missed. Darren Bent (Fulham) right footed shot from outside the box misses to the left. Attempt saved. Darren Bent (Fulham) right footed shot from the centre of the box is saved in the bottom left corner. Attempt missed. Jeffrey Schlupp (Leicester City) right footed shot from the centre of the box misses to the left.